Never Say Die: “The Goonies” Celebrates Its 25th Anniversary in Historic Astoria, Ore. Eager to revisit secret caves, treacherous traps and hidden treasure, fans will gather in historic Astoria, Ore., to celebrate the anniversary of the cult classic film “The Goonies” June 4-7, 2010. 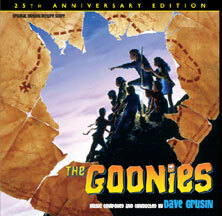 Over the four-day event, Goonies lovers can retrace the steps of characters in the film by touring filming locations including the famous “Goonies House,” bowl at “Chunk’s Bowling Alley” and more, plus have the chance to mingle with original cast members including Corey Feldman, Jeff Cohen, Joe Pantoliano and Curt Hanson. As part of the 25th anniversary festivities, the new Oregon Film Museum will open its doors for the first time. Converted from the old Clatsop County Jail featured in “The Goonies,” the museum is dedicated to preserving and celebrating the art and legacy of Oregon films and film-making. One of the many highlights is a special exhibit in the actual jail cell from, “The Goonies,” as well as stories, mementos and props from famous movies made in Astoria and across Oregon, such as “Kindergarten Cop,” “Animal House,” “Twilight” and more. Visit http://www.GooniesAnniversary.com for complete event details. Official memorabilia, including t-shirts, hats, glassware, collectible doubloons and more, will be available at the event headquarters affectionately named The Goon Docks, located at 15th and Marine Dr. in Astoria. Invictus. He was imprisoned 27 years for his heroic fight against apartheid. So what does Nelson Mandela do after he is elected president of South Africa? He rejects revenge, forgives his oppressors and finds hope of national unity in an unlikely place: the rugby field. Clint Eastwood (the National Board of Review’s 2009 Best Director choice) powerfully directs an uplifting film about a team and a people inspired to greatness. In a performance that won him NBR’s Best Actor Award and an Oscar nomination, Morgan Freeman (Best Actor Oscar nominee) portrays Mandela, who asks the national rugby team captain (Best Supporting Actor Oscar nominee Matt Damon) and his underdog squad to do the impossible and win the World Cup. One team, one country. The universal language of sports has never spoken so thrillingly as in Eastwood’s “Invictus.” DVD. 133 min. ; Recommended for ages 5-18. The Spy Next Door refers to Bob Ho (Jackie Chan), a square but safe next-door neighbor and boyfriend of Jillian, a single mom with three kids. She is glad to have an honest and dependable guy in her life. The kids are dead set against the relationship because he’s, well, just a big geek. When Mom needs to leave town suddenly, Bob offers to care for them, thinking it will give him a chance to make the kids like him. What no one knows is that Bob is actually an accomplished Chinese spy working with the CIA who has just worked his last job and has retired in the hopes of settling down with Jillian. The kids put Bob thru the wringer, but trouble really starts when the bad Russian guys come after Bob and the kids. Jillian breaks up with Bob when she realizes he has put her kids in danger. In the end, the kids come to his defense, the couple gets married and a new family is born. What will appeal to a youth audience the most are the action scenes. The good guy spy, with help from the kids, fight the evil Russian baddies. There are lots of martial arts scenes, but the action is almost cartoonish and we see no blood and guts. There is only scene where a bad guy gets a bloodied nose. The heart of the film is delivered by Jackie Chan when he tells his girlfriend’s teenage daughter that family is what you make, who you love and who loves you, not just the blood that runs in your veins. It’s good advice, and she grows to accept him as a potential step-father. It also helps her embrace her own family after feeling she didn’t belong. Watching Bob trying to care for three unruly kids is truly humorous. The emotional arc of the kids letting down their defenses and allow a new man into their lives is something many kids can relate to, whether it’s happened to them or they have seen friends experience similar things. The film is certainly derivative of other James Bond-for-kids type movies such as Spy Kids but doesn’t really add anything original or memorable. The true appeal of this film is Jackie Chan, who gracefully moves between his two identities – the super square pen salesman who lives next door, and the super cool and capable Chinese spy working with the CIA. Plus, he’s funny. That surprised us. KIDS FIRST! Child Juror Comments: I like all the sneaky spy stuff like his super sword belt and his choppy uppy ring. The story was cool – how the babysitter was a spy. My friends would love this because it has sneaky spy stuff. It looked great and everything was clear. The actors treated each other well. It was a bit predictable with the guy and lady getting married at the end, but that was good. I liked how it ended. My favorite part was the one fight scene where Jackie Chan used the bike. He did cool things with the bike. Recommended for ages 5-12. Great Indie Film for Dog Lovers! 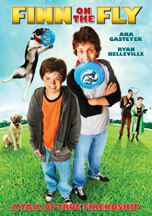 Posted in New Releases | Comments Off on Great Indie Film for Dog Lovers! Check this out. I took two boys, ages 6 and 10 to see this in the theaters and they just howled! Loved it. Loved the comedy. Loved seeing “The Rock” in this role. Tooth Fairy. Hockey player Derek “The Tooth Fairy” Thompson (Dwayne Johnson) is a big, tough guy whose pro career fizzled but who continues to please crowds by being the heavy for his minor team. While he’s got an attractive girlfriend (Ashley Judd) with two kids, he has a very bad attitude and tends to rain on everyone’s parade, particularly those of children with big dreams. To teach him the error of his ways, he is summoned to Fairy Land (presided over by Queen Fairy Julie Andrews and helped by wizened Billy Crystal) where he sprouts wings and learns he must perform the job of Tooth Fairy for two weeks. Crazy antics ensue, with the man suddenly sprouting wings at inopportune times and having a nightmarish time trying to fulfill his sentence. In the meantime, he begins to bond with the girlfriend’s son, who is himself suffering a crisis of confidence. Eventually, both man and boy learn to believe in the power of dreams, build confidence through hard work and determination and open their hearts to love of self and others. This is good, solid mainstream Hollywood family fare. Big name actors (Dwayne Johnson, Julie Andrews, Billy Crystal, Ashley Judd) appeal to parents, fantasy antics appeal to kids and the happy ending means everyone walks away satisfied. Kids will laugh at the physical humor. The audience age for this is probably 5-12, with 12 stretching it a bit. Filled with silly physical humor, hockey action and a well acted portrayal of a guitar-playing pre-teen boy who learns to believe in himself. The humor certainly works for intended audience. While there is a bit of relatively violent action in the hockey rink, it’s no more brutal than a televised NFL football game. The heart of the film is about a man who has lost his confidence and therefore assumes everyone is doomed to fail like he has. His negative attitude and progress toward change are easily comprehendible for a youth audience. It’s a message both kids and adults can relate to and does offer some good talking points to open up a discussion with your child. KIDS FIRST! Child Juror Comments: I watched this with six and 10-year-old boys. They loved it. In fact, they were so drawn into it that they never even sat back in their seats at the theater, they leaned forward the entire time. Both boys are really into sports so they knew who Dwayne Johnson was and loved the hockey playing scenes in the film. The goofy slap stick humor was right up their alley and they clearly appreciated all of it. They would definitely watch it again, and most likely will when it comes out in DVD. Thumbs up from these guys. DVD. 101 min. ;Ages 5-12. You are currently browsing the Granny Ranny's Coming Attractions weblog archives for May, 2010.